Tipify is an advanced IoT Technology, used by Service Providers, primarily for Smart Building Applications to reduce Energy Consumption and Cost, and for Smart Grid Solutions including Demand Side Management and control of Distributed Energy Resources to control how and when energy is used so as to optimize resources and cost. The Tipify System is high performance, fully distributed, hugely scalable and inherently secure. It runs in T-Star Edge Devices that are deployed in the Buildings and in Enterprise Server software that can be run in local Servers, Data Centers or on Cloud services. The System Integrates with existing Building and Energy Systems, and provides an Energy Information and Management System, Edge and Server based Analytics, Control, Visualization and Reporting. Intellastar Connect is a cellular Data Service used to securely connect Edge Devices in remote buildings to the Enterprise Server. Results are shown as Sparks and Visualized to show frequency, duration and cost. 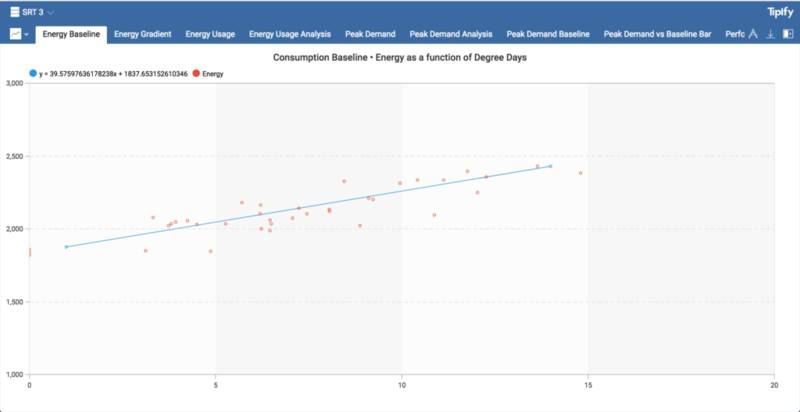 The Tipify Analytics App uses a combination of Mathematical, Logical and Statistical methods for Analysis.This powerful Tool can be applied to any sort of data analysis, but for Buildings and Energy it is most commonly used for FDD - Fault Detection and Diagnosis - and Performance Analysis of Equipment. The output of the Rules Engine are called ‘Sparks’ and the novel visualization shows the time, frequency and duration of the Sparks very clearly. Using the cost function with the fault detected helps prioritize the resulting actions. With 500 + rules and components in the Library and Custom Programming using Axon, the Tipify Scripting Language designed specifically for this purpose, these Analytics have great power and flexibility. Equipment and system data is normally collected from the BAS and other Control and monitoring systems by the T-Stars and processed through analytics to find faults and problems. Sparks from multiple T-Stars and Servers can be brought together and viewed in a seamless manner. All data Visualization is fully Web Based and uses HTML5 so it can be viewed directly on PC’s, Laptops and Tablets directly without plug ins. The Rules can either be run in T-Stars or at the Central Server providing a fully distributed system with Edge Analytics – aka Fog Computing. Edge Analytics are important as rules for equipment running under Automatic Control such as Chillers or AHU’s, require high frequency data – typically every 1 minute interval – to work effectively. It is more efficient to process this High Frequency data locally and send the resulting Sparks back to the Server rather than transport, store and process all the data back at the Central Server. Other analytics such as Energy Performance needs low frequency data, 15 mins or more is the norm, and is stored as a long term record so it’s best stored and Analyzed at the Central Server. 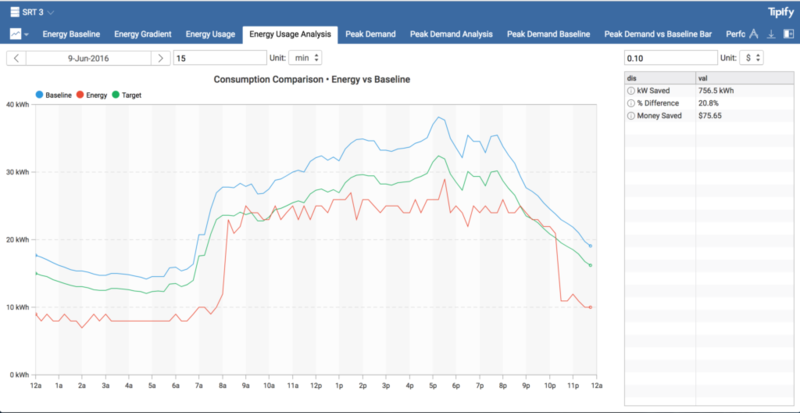 The Tipify Energy App is a powerful tool to process Energy and other consumption type Information. Consumptions Data is captured by Meters connected to T-Stars or is imported from Utility Data or other sources using industry Standard formats such as oBiX, CSV files, Excel spreadsheets and Green Button. Data can be rolled up into appropriate time periods, checked for Data Quality and Normalized. When analyzing Buildings, Degree Day and Building Floor size are the normal metrics, but other parameters can also be used. Normalization unifies the data so comparisons between different Building and Locations Weather Data can be automatically gathered by the Weather Service using Geo-location of the site Regression. Analysis is used to create a Normalized Base Line for each Building that is used to set Energy Targets. Base Line and actual consumption are compared using CUSUM to calculate Savings. This methodology complies with the International Measurement and Verification Protocol - IM&V - for calculating Energy Savings. 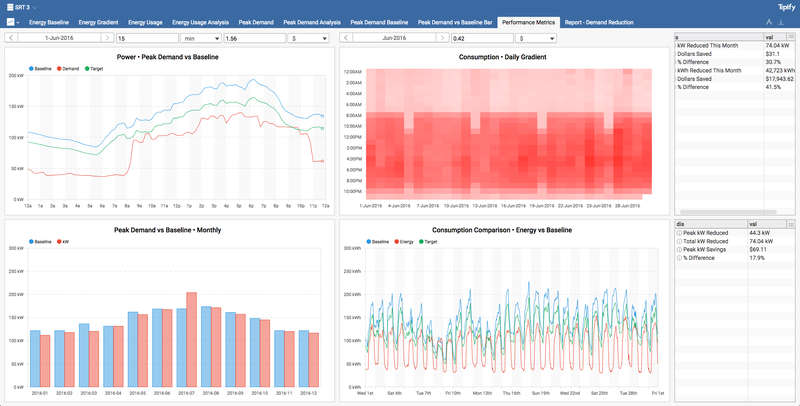 Tipify Views visualize the Energy Data clearly and simply. 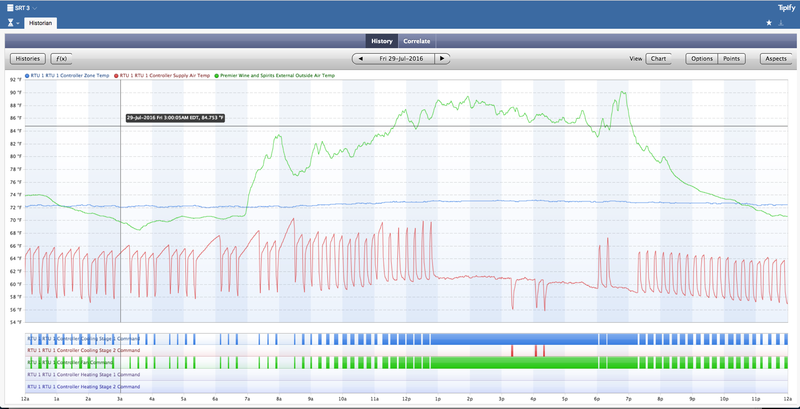 Users can see Time Series Views and adjust the time period and roll up. Views are incorporated into Reports along with Annotation and Comments and sent as PDF documents to show and explain the performance achieved. Energy Services Businesses need to produce Reports regularly for their clients to show the performance and benefits achieved. The Tipify Reports Application makes it straightforward to incorporate a collection of Views that are in SVG format and using the WYSIWYG Editor, render them into PDF documents for e-mailing and printing. Annotation and comments are added to provide a complete Reporting Mechanism.